I was determined to get out on a couple of free days no matter what the weather was. The forecast was for rain and as it had been raining a lot the past few days I was expecting the trails to be wet. This entry was posted in Backpacking, Our Backpacking Trips and tagged Hercules Glades Wilderness, Long Creek Trail, Tower Trail on March 24, 2019 by Gary. Three Days Solo Backpacking in Late January – The weather had turned warm, and the recent snow had disappeared, so I headed off to Hercules Glades with the intention of spending some more time contemplating Life, The Universe, and Everything. This entry was posted in Backpacking, Our Backpacking Trips and tagged Backpacking, Hammock Camping, Hercules Glades Wilderness on January 26, 2019 by Gary. This entry was posted in Affiliate Links, Backpacking, Our Backpacking Trips, Trip Reports and tagged Backpacking, Hammock Camping, Hercules Glades Wilderness, Hiking and Backpacking Maps on November 18, 2018 by Gary. A two-day hike at Hercules Glades to try out my new tarp and underquilt for my hammock. By taking a long route, I hiked 10 miles from the Coy Bald trailhead to Long Creek Falls and back. This entry was posted in Backpacking, Our Backpacking Trips and tagged Backpacking, Hammock Camping, Hercules Glades Wilderness, Long Creek on May 23, 2018 by Gary. If you are planning on going to Hercules Glades, Bar K Wrangler, or the Glade Top Trail from Springfield via HWY125, there is a 36-mile detour in place while the bridge at Swan Creek is replaced. This entry was posted in News and tagged Hercules Glades Wilderness, News on May 10, 2018 by Gary. The last time Ginger and I went backpacking together was in August 2017. Family events, work, and lethargy has gotten in the way. For this trip, Ginger chose the trail — Hercules Glades Wilderness, Pees Hollow trail, and I chose the route — Counter-clockwise. This entry was posted in Backpacking, Our Backpacking Trips and tagged Backpacking, Hercules Glades Wilderness, Pees Hollow Trail on May 5, 2018 by Gary. Pees Hollow Backpacking Trip – My new Hammock arrived last week and I couldn’t wait any longer to try it out. This entry was posted in Backpacking, Our Backpacking Trips, Trip Reports and tagged Backpacking, Hammock Camping, Hercules Glades Wilderness, Missouri, Pees Hollow Trail, Taney County, Utility Kilt on April 10, 2018 by Gary. It was time to go out on my long awaited backpacking trip with a hammock. Plan ‘A’ was for us to go on a quick, one-night visit to Hercules Glades Wilderness. When Ginger decided she wasn’t going, I quickly came up with Plan ‘B’ which transformed the quick one-nighter into a solo three-day, Friday through Sunday trip. This entry was posted in Backpacking, Our Backpacking Trips, Trip Reports and tagged Backpacking, Hammock Camping, Hercules Glades Wilderness, Taney County, Utility Kilt on March 25, 2018 by Gary. This entry was posted in Backpacking, Our Backpacking Trips, Places We've Been and tagged Backpacking, Hercules Glades Wilderness, huaraches, MSR Mutha Hubba, Ozarks, Pees Hollow Trail, Spring on February 19, 2016 by Gary. We found our van on Google Earth, it’s parked at the Coy Bald Trailhead, Hercules Glades. This entry was posted in Campfire Chat and tagged Google Earth, Hercules Glades Wilderness on July 24, 2013 by Gary. We love campsites with spectacular views, who doesn’t? We hoped we’d managed to find a fantastic camping spot on top of a set of 260 ft. high bluffs overlooking Beaver Creek, in Hercules Glades Wilderness, we just needed to get there and check it out. 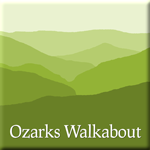 This entry was posted in Backpacking, Hiking and tagged Backpacking, Hercules Glades Wilderness, Hiking, Missouri, Ozarks, slide, Taney County on April 19, 2013 by Gary. This entry was posted in Hiking, Our hikes, Places We've Been, Trip Reports and tagged Backpacking, Hercules Glades Wilderness, Hiking, MDC, Missouri, Missouri Department of Conservation, Ozarks on December 18, 2010 by Gary.